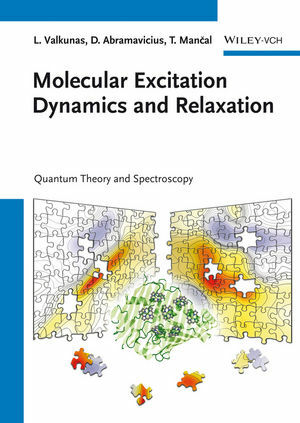 This work brings together quantum theory and spectroscopy to convey excitation processes to advanced students and specialists wishing to conduct research and understand the entire fi eld rather than just single aspects. Written by experienced authors and recognized authorities in the field, this text covers numerous applications and offers examples taken from different disciplines. As a result, spectroscopists, molecular physicists, physical chemists, and biophysicists will all fi nd this a must-have for their research. Also suitable as supplementary reading in graduate level courses. Professor Leonas Valkunas is Chairman of the Dept. of Theoretical Physics as well as of the committee for studies of biophysics at Vilnius University, Lithuania. His research interests are excitation and charge transfer, spectroscopy of molecular structures and biological macromolecules, including nonlinear methods. Fellowships and research assignments included, after a Fulbright Scholarship at UC Berkeley, stays at New York University and Free University of Amsterdam. Darius Abramavicius is researcher at UC Irvine, CA, USA. Earlier assignments involved research at National Taiwan University, Taiwan, University of Rochester, NY, USA, and University of Vienna. His research interests include nonlinear dynamical systems, quantum computing and coherent control. Tomas Mancal is research scientist at the Charles University in Prague. After earning his PhD at Humboldt-University at Berlin, Germany, conducted research at institutions like the Lawrence Berkeley National Laboratory and UC Berkeley, USA. His research interests include Non-linear optical and infra-red spectroscopy, ab initio calculations of spectroscopic properties, open quantum systems, and optimal control of molecular dynamics.